Hey guys!! 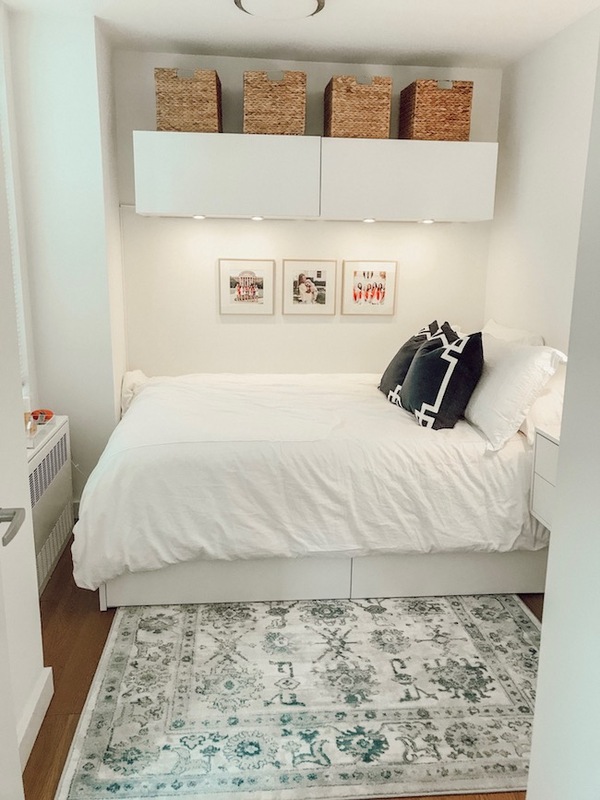 I am SO excited to share a little bit of my new bedroom in New York! I posted this photo on my insta story earlier and I got so many questions about where things were from I thought I'd write up a quick post so that everything can be found in one place! I am so excited to do a full room tour soon (although this shot is almost the full room hahaha). It was fun to design this room because I had to get so creative storage. Since my room is pretty small and I don't have room for any sort of dresser, I decided to utilize the vertical space with these shelves and I am so happy I did! Bed - It was a no-brainer for me to get a bed with storage and this one is great! The drawers are really deep and wide so I've been able to fit a ton of stuff in them! Rug - I love this rug because it adds a little color but doesn't make the room feel smaller. A darker rug could make it feel closed off. Luckily, since my room is so small I only had to get a small rug and it wasn't too expensive! Shelves - These shelves are my favorite part of my room!! I was browsing through ikea and saw them on display and couldn't believe how perfect they were! I've been able to fit a lot of stuff in them and even some more things on top of them in those baskets! It really made a huge difference in terms of storage space. I also love that I added the lights (which were also on display in ikea) because they're really cool and functional. Picture Frames - Why is it so tough to find gold square picture frames!? These ended up being perfect but gosh nowhere sells gold frames that aren't $40+ per frame! Night Stand - Since my bed has the oh so important drawers, my night stand couldn't block that part of the ground if I wanted the drawers to be usable. Another great ikea find was this floating cabinet that's perfect for my nightstand! Pillows - I had these for the last 2 years of college as well and I love them! They've been great because as my style changes, these pillows have still worked. Baskets - I am obsessed with these baskets!! I don't even know why but they're great for storing just about anything. Before I go! Huuuuuuuge shout out to my dad for helping me this weekend by putting together alllll of my ikea furniture!! I don't know what I'd do without him! and my mom too who also helped! Hi guys!